Bogor- The event began with a welcoming speech from Dr. Nunung Nuryartono (Director of InterCAFE) to more than 65 seminar participants. Prof. Christopher Findlay (Executive Dean of the Faculty of the Professions, University of Adelaide – Australia), representative from Adelaide University-Australia continued the agenda with speech on the university consortium among IPB, Adelaide and Flinders university as a very important relationship and appreciate the seminar so much. Prof. Dr. Anas M. Fauzi, M.Eng (Vice Rector for Research and Collaboration, IPB) officially opened the seminar and emphasized the role of collaboration for the university. He hoped that collaboration between InterCAFE with Adelaide and Flinders University will be long lasting and looking forward with more and wide agenda. 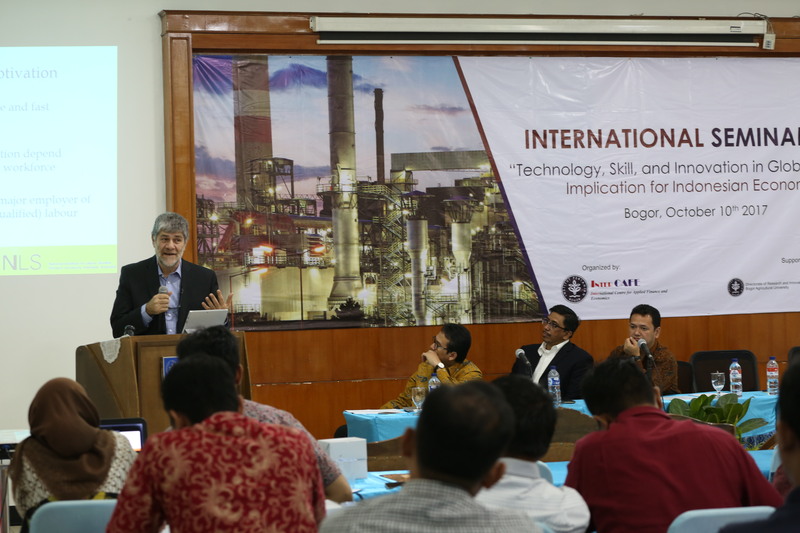 Prof Anas also explained the collaboration activities conducted by IPB and other countries such as universities in USA, and University of Goettingen, Germany which cover wide issues. Related to the seminar theme, Prof. Anas also emphasize the important role of technology information and human skill for economic development. Prof. Shandre Thangavelu presented “Skills & Technology”. He explained that technology itself is an issue. There are changes of lifestyle since technology is a human need. One of the good example is Gojek application. Nowadays, there is more Gojek user than taxi’s user. Several challenges are emerging in asia. One of them is the question on economic and trade liberization. There is also rising inequality and rising wage gap between the skilled and unskilled. In addition, middle skills are disappearing which lead to polarization of skills. Indonesia may face middle-income trap. How to create social value is very important. A good example is the regulation that allow application like Gojek emerged to human life. People need to challenge himself to move up. The new technology take long time to understand. That is social disruption. In this situation, old technology disappear followed by the fast appeareance of new technology. Prof Kostas Mavromaras explained global competitive and fast changing environment. Technology, skills, and innovation depend critically on a strong graduate workforce. Indonesia has now become a major employer of graduate labour. In Indonesia, approximately 300,000 employed degree qualifies graduates in 1986. Human capital continue to change with remarkable growth and potential. It can be considered as problem too. To address the problem rising from too much graduate it is good to looking from other countries experience. In 2002 – 2012, there is 20% over-educated graduates, 13% over-skilled graduates, and 6% over educated and over-skilled graduate. However, these skill surpluses are making their contibution towards below-potential growth. Research has shown that peoples who mismatch their job tend to quit more often and find less job satisfaction. In 2005 – 2007, Australian SMEs face skill shortages. Between 15% and 28% report some form of shortage, 46% one cause; 33% two cause and 20% three or more (the very complex ones). In order to balance the labour market, we can follow the country orientation, what the country currently need. In conclusion, skill shortages also contribute towards below-potential growth. Both types of skills imbalance imply that the economy is working inefficiently and below potential.